Wait. Another TSIDDC?! Yes. I don’t know if it is because I’m that bored, or that I simply have great inspiration at the moment. Ah well. 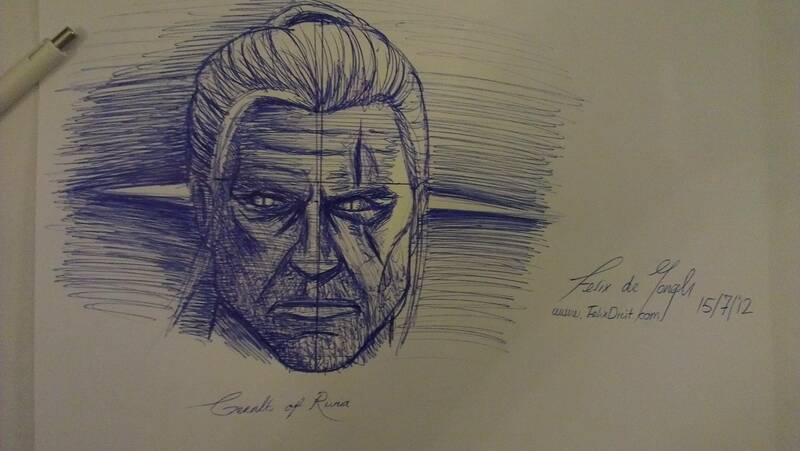 Here’s Geralt of Rivia from the game ‘The Witcher’ and ‘The Witcher 2: Assassin of Kings’. It might be a bit nerdy, but his head is very typical and satisfying to draw. The lines across his face are because I originally wanted to make this the composition drawing, later redrawing it. While making it, I noticed the lines didn’t bother me and I kept on drawing, sketching with my trusty ballpoint. I hope you like it.